Itinerary at a glance: Huaraz – Catac – Querococha lake, Geological faul (Map of Peru) – Conde ravine, Cahuish tunnel – Conchucos valley – Tambillos – Shirapata – Hirca – Machac – Querkos – Chavin de Huantar. This cultural and historical tour visits the southern part of the Callejon de Huaylas, the Querococha sector, and the Callejon de Conchucos. From Huaraz we head south, visiting along the way the picturesque town of Recuay, where the famous cave, San Patricio, a.k.a. “the Devil’s House”, is located. We then visit the towns Ticapampa and Catac, from the latter of which we take a road heading east in the direction of the archeological complex, Chavin de Huantar. Along the way we will visit lake Querococha and see a geological fault, which resembles the map of Peru. Upon passing the Conde ravine and crossing the crest of the Cordillera Blanca via the Cahuish tunnel (which is one of the world’s highest), we descend deeply into the Callejon de Conchucos visiting towns such as Machac and Keros, finally arriving in the town of Chavin, which is situated on the banks of the rivers Huachecsa and Mosna. Just outside of town is the impressive archeological complex of Chavin de Huantar, whose imposing architecture expresses the grandeur of its times. The walls of the main temple are inclined like a pyramid’s and were decorated by fearsome “Cabezas Clavas” (tenon heads). We will also see the great ceremonial square and the internal galleries, the latter of which holds the “Lanzon de Chavin”, an enigmatic knife-shaped stone sculpture measuring more than three meters in height. 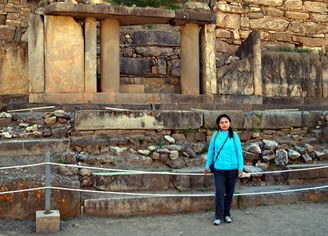 The structures were built by what we call the Chavin culture and are dated to 1200 B.C. After visiting the complex and eating lunch, we return to Huaraz by the same route.